English With Elizabeth - › Frequently Asked Questions › F.A.Q. Please feel free to click the frequently asked questions from my customers listed below. What advantages do regular customers have? Regular customers will be privy to English help first. In addition, regular customers will be able to reach me via e-mail, Skype or landline telephone at all times, unless I specify otherwise. Could you help our European company correcting the English Language on our website? Yes. I am skilled in Advanced English and I am able to correct most written text. However, if your website is not written in English to begin with, I cannot help you. Please provide a rough translation of your information contained on the website, and send me the finished translation. I can do the rest. How do I become a regular customer? If you wish to become a reglular customer/client, simply submit your intention to further utilize my services on www.englishwithelizabeth.com, along with your first assignment you need help with. I will be in touch with you as soon as possible. I stand by my work absolutely. If you are not 100% happy with my skills, and you are able to prove I failed to provide the Services I stand by, you will be refunded immediately. Can you help my children online with their English homework? I am available to help children online, at all times. However, I insist a parent submit the request primarily, otherwise I cannot be of service. How would I send payment for work received? I have listed several methods of payment on the 'Contact Me' page. They include Money Orders, COD, Personal Cheques and Credit Cards. 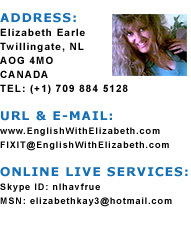 If you become a client of www.englishwithelizabeth.com, all payment issues will be satisfied afterwards. Do you offer proof-reading services within your site? Yes, I offer proof-reading services, providing the original document is written in English.